Video: Watch An iPad Freefall From 100,000 Feet | OhGizmo! I guess that G-Form, makers of the super tough Extreme Edge iPad case (among other things), are trying to recreate some of the marketing magic that Blendtec had going with its Will It Blend series. They’ve produced a series of videos putting the iPad through seemingly increasingly horrifying torture tests, from dropping a bowling ball onto it to tossing it out of a moving car. 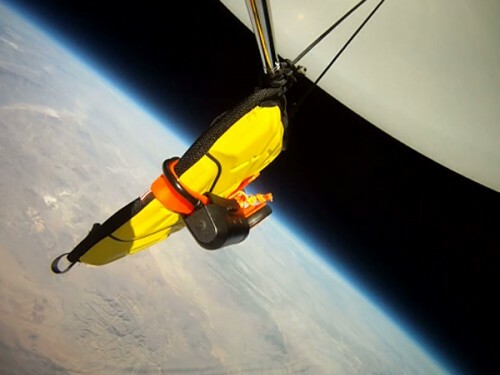 The latest such video has them tie the iPad with case to a weather balloon and letting it rise to the edge of space. 100,000 feet or so. Then the balloon pops and everything comes back down. Of course, since they’re releasing the video, the iPad survives. I’m not sure this particular video is that compelling a case for the Extreme Edge’s toughness; the entire freefalling setup would hit terminal velocity way before the 100,000 had been exhausted. Also, the trailing shreds of balloon made it so that it landed screen facing up; the other way around would have produced very different results. Still, it’s entertaining to watch. The case itself is $45. I can’t believe a $45 case saved the iPad from Free-falling all the way down to earth. It’s a nice video btw. I love the shot of seeing the edge of the earth’s atmosphere. I am not really all impressed with this one. Since the spinning of the whole package, the ipad, the video cam and the extended arm for the camera create a drag that possibly decreased the impact of the landing. But the way they got the video is quite stunning. While I don’t think that very many iPad users will have their iPads plummet to the earth from that distance, Its a good selling point for durability.